Another oil from Trevor with that Alla Prima ” Feel” exploring the Moroccan colours from purples to browns. Exquisite and loose handling brings this scene to life with attention to anatomical detail and a ” Snapshot ” appearance. Bold strokes of paint dance across this canvas portraying a timeless scene of market bartering. 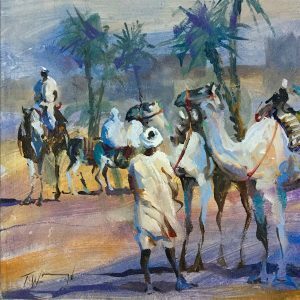 ” Simplicity of subject and directness of application is key to success in my painting .” A square format work ,makes for an interesting yet odd composition. The addition of striped blankets emphasises the location and are echoed by the bolder strips of colour used to describe the desert floor.